Desire to Decorate: Hurray, it arrived! I'm so happy to have received the eames style rocker from Wire Home Furnishing, a recently added sponsor, read it here. I love it! I had it in familyroom this morning and I saw Liam admiring it and then, rocking away so I suspect he'll be excited to see it in his room later today. Hopefully, he doesn't commented about it not being blue. It's so comfortable... I wish I had purchased it when the boys were babies! I think this chair is so vertistle, a great modern solution for the traditional rocking chair and a nice addition to a grown up space. 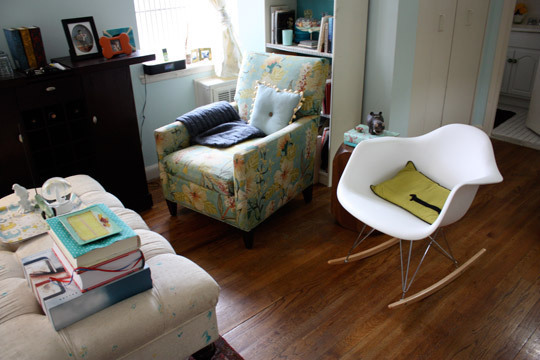 And, I have more exciting news to share... Kevin at Wire Home Furnishing is extending a special discount of 15% on Eames Chairs for desire to decorate fans. Just send him an email to buy yours... and remember if you spend $500. you'll also receive FREE shipping.